Back in September, the Cassini probe, which had explored Saturn for over a decade, plunged into the planet and sent a farewell signal to Earth before it was torn apart. 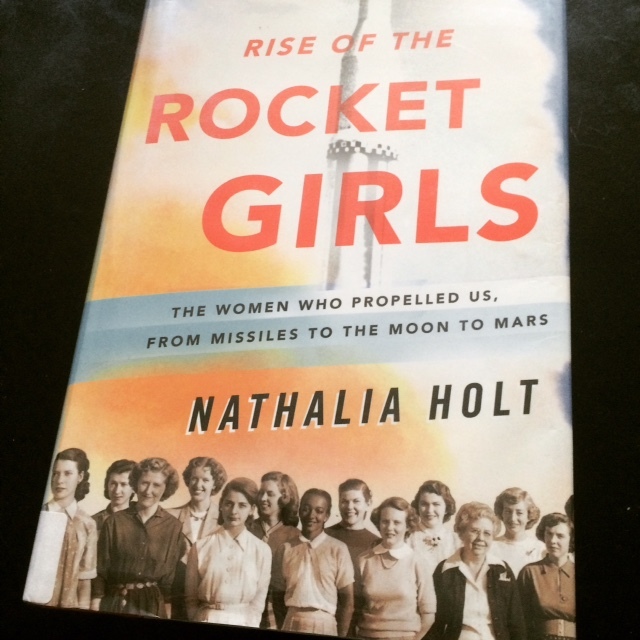 Around this time, I finished reading Nathalia Holt‘s Rise of the Rocket Girls: The Women Who Propelled Us, From Missiles to the Moon to Mars, which chronicled the careers of the women who built the Cassini spacecraft. Not only that, but they also helped craft the first ballistic missiles used in war, sent humans beyond the reach of Earth’s orbit, and opened many, many doors to space exploration. When I was little, I wanted to be an astronaut. Being the unbelievably nerdy kid that I was, I created a fat binder of newspaper and internet clippings about outer space, reviews of space ice cream, and what to expect from zero gravity training. My shelf hosted a range of relevant books. I was excited to visit the Kennedy Space Center at Cape Canaveral on a family trip to Florida. On another occasion, I got to meet Sally Ride and shake her hand, fangirling the entire time. So I felt a thrill as I read about the women of NASA’s Jet Propulsion Laboratory (JPL) — one of whom, Susan Finley, still works at NASA today at the age of 80 — who worked tirelessly to make the astronauts’ missions successful. Called the human “computers,” the women performed intricate mathematical calculations that proved crucial to their male engineer counterparts. Starting with the aftermath of the Great Depression and continuing through the Japanese attack on Pearl Harbor, the impact of World War Two, the Cold War era’s fixation on communism, the Cuban Missile Crisis, Americans’ shock over JFK’s assassination, the break-up of Beatles, the release of the first Star Wars movie, and all the way to the present day, Holt writes an in-depth reflection on US history and culture through the lens of our space endeavors. She skillfully aligns the events of each decade with the lifelines of NASA’s female computers. The care she takes with describing the women, their dreams, and their successes and failures makes you feel as close to them as if they were your sisters, mothers, and aunts. Holt’s women experienced multiple disappointed attempts on their way to achieving their goals, whether their aim was to simply push the first rocket beyond Earth’s atmosphere, to send men and women into space, or to land rovers on Mars. And as space tech underwent rapid changes over the decades, NASA’s computers had to continuously learn many different tools and strategies for getting work done, moving from making calculations on pen and paper to managing room-size computers to writing FORTRAN on a personal computer. Marriage, pregnancy, and societal expectations forced many women to give up their positions at NASA — sadly, even if they didn’t want to leave, they were often blatantly told to go — but many of them found their way back to the roles they felt passionate about. Those computers who stayed at NASA the longest eventually became rightfully known as engineers. One theme that sticks with me, upon finishing the book, is that of women elevating other women. The female leaders of NASA’s computer lab, notably Macie Roberts and Helen Ling, made a point of hiring and mentoring other women, including those of color. They believed men would be too difficult work with — partly because of what they perceived as men’s thirst to appear superior to women. In the end, Roberts and Ling grew a strong culture and sisterhood that today results in JPL employing more women, in all positions, than any other NASA center (Holt, 281). If you’re looking for an inspirational read, I’ve got to say this is it.